Sometimes you see movies long after their influence has been felt and each scene has been ripped off to the point that everything in it has become a cliché. 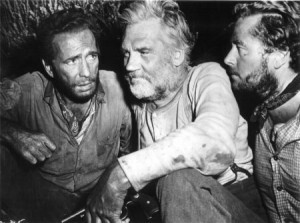 The Treasure of Sierra Madre appears to be constantly going in an interesting direction especially during its darker passages, but never quite commits. Is it that Huston, et. al, were afraid of alienating the audience by making the movie too depressing and felt the need to follow some conventions for reassurance? The movie was critically well received but did not do well financially, perhaps because audiences were not used to seeing Bogart play the villain. A lot of times, scenes seemed to be added as filler, which seems odd for something that’s a little over two hours. 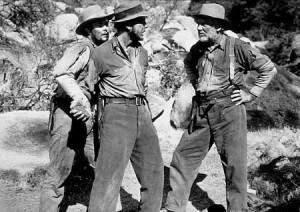 One thing that had me laughing out loud was the scene where Walter Huston, Bogart, and Tim Holt keep waking up and wandering outside the tent, as each member seems to be checking on the other to make sure they’re not stealing their share of the gold. It happens three times in a row, and I imagined that they were playing musical sleeping bags. Bogart avoids looking ordinary with his grizzled beard, but once he shaves it off, he becomes almost forgettable. I was happy that it only took 5 or more minutes of screen time before he was haggard again. Bogart’s character is dazzlingly dim-witted, and I sort of hoped that the kid who sells him the lottery ticket had tricked him into giving him the 10% cut by printing up a fake newspaper. Otherwise, as it stands, it’s a poorly conceived and obvious contrivance that the kid just happens to show up at the exact moment they need $100. The shoot-out on the train was embarrassing. Was Huston that desperate to drum up excitement? What purpose does it serve? Does it really matter that they “set up” the later appearance of one of the thieves that Bogart wasn’t able to shoot? The whole scene plays like they stopped off to play a video game (Hogan’s Alley perhaps), or a ride at Universal Studios. When Bogart begins bragging, “I got three of ’em, bet that’s more than you got. Almost got shot 2 inches from my face,” I grimaced. What fantasyland does this scene take place in? It’s done in such a nonchalant fashion. The bandits start firing at the train, and everyone just seems to waiting for this to happen, they whip out their guns (the entire car is packing?) and all are crack shots. And the relaxed level of this scene is totally at odds with something that happened a few minutes later, which seemed to be insignificant but played at a totally different level. They get to the top of the mountain and Bogart says that he thought digging for gold would be different, put it in your pocket and take it to the bank. Then they drain the water and this ridiculously dramatic music plays, signaling a moment of mystery or some profound discovery. They go through the water and the music gets louder. But we don’t see them find anything and there is a dissolve to later that night and the music fades out. Why was the music played in the first place? It was the kind of music that would signal the revelation of Orson Welles in The Third Man or Keyser Soze, not a dissolve because nothing really happened. I was disappointed by a lot of the genre conventions at play, but there were some things I did like about the film. The decision to play all of the Spanish dialogue without subtitles was a wonderful idea, because the translation was not needed to understand the meaning. Reminded me a lot of Boorman’s idea not to use subtitles for Toshiro Mifune in Hell in the Pacific. Playing the shootings mostly off screen was also smart, especially the executions, although I’m not sure it didn’t have anything to do with the censorship at the time. It made them much more effective. When Bogart thinks he has killed Holt and has a whole scene where he was talking to himself, his rambling was fascinating. I thought of Bruce Campbell’s amazing performance in Evil Dead II, where he is simply dealing with the constantly changing elements, and trying not to lose it, and slowly losing the battle. Of course Campbell manages this for almost 45 minutes of screen time, which is slightly more of an accomplishment in showing us a descent into madness. 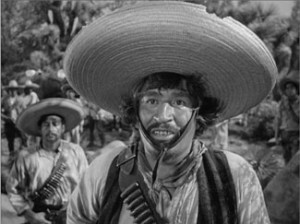 Unfortunately, the ending of The Treasure of the Sierra Madre seems too genial and light considering the material that led up to it. Huston and Holt’s laughter do not seem to be of the bitter kind, but rather of the type at the end of a kids’ TV special, where they’ve “learned their lesson.” Also, distractingly, Huston’s laughter is out of sync one or two times. Overall, the tone wavered and I wish they had either stuck with the lighter more westerny material, or gone in the direction that it starts to at times, where greed and deception seems to be overriding their allegiance to each other, rather than simply have Bogart play pure evil and the other two stay innocent. 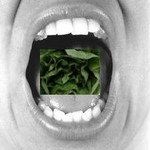 This entry was posted on Thursday, January 22nd, 2009 at 12:01 am	and is filed under Action/Adventure, Western. You can follow any responses to this entry through the RSS 2.0 feed. You can leave a response, or trackback from your own site.